The Guards Trophy GT and Sports Racing Championship is contested by Pre 66 GT cars and Pre 69 sports-racing cars with an international sporting pedigree from period. Included from 2014 is an invitation class for larger engine Sports Racing Cars built prior to 1968. The series mainly runs to a mini-enduro format and there is a non Championship race for Guards eligible GT cars at he Autosport Three-Hour race at Snetterton with a one hour race for the Sports Racing Cars. 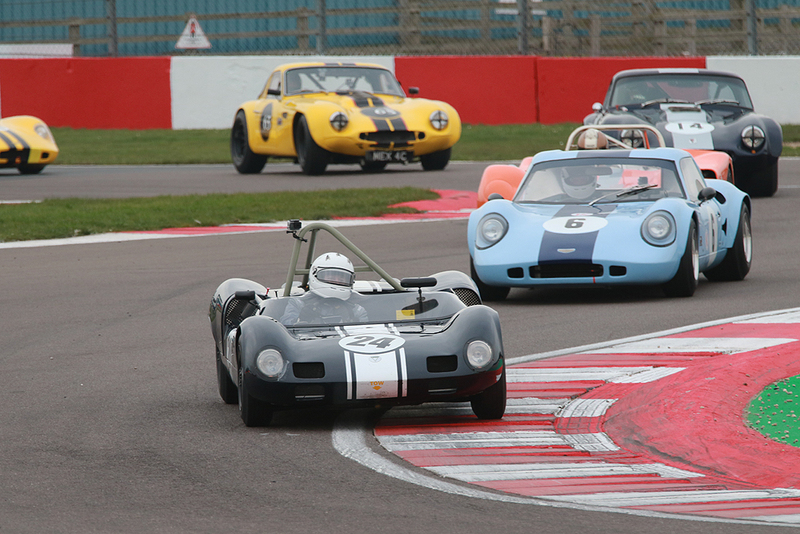 The HSCC GT & SR Championship is open to sports racing, sports, GT and GT Prototype cars built prior to 31/12/65, which have, as a model, International competition history in period. Regulations are as FIA Appendix K, namely full period racing specification in accordance with manufacturers’ homologation forms. There is also a Championship class for sports-racing, and sports prototype cars built before 31/12/1968. All vehicles must have an FIA HTP Technical Passport to be eligible for Championship points. There is also an Invitation Class, not eligible for the Championship points for GT and GT Prototype cars built prior to 31/12/73. Any period cars of Historic interest that fall within the date specification of the Championship but do not have FIA Historic Technical Passports may be accepted by the invitation of the Championship organisers but will not be eligible for Championship points. Continuation cars or replicas are not eligible. SRA For sports racing cars unlimited engine capacity built and raced up to 31/12/59. SRB For sports racing cars under 1600cc built and raced between 1/1/60 to 31/12/65. SRC For sports racing cars 1601cc – 2000cc built and raced between 1/1/60 to 31/12/65. SRD For Sports Racing, Sports Prototype and competition GT up to 1601cc to 2000cc built and raced before 31/12/68. SRE For Sports Racing, Sports Prototype and competition GT up to 1600cc built and raced before 31/12/68.